Binding Off: Boxy cardigan done! The pattern is the Michael Kors boxy cardigan from Vogue Knitting Spring/summer 2007. The yarn is Di.Ve Zenith 100% merino wool. I used under 10 balls. I’m pretty pleased with the result. It is a very soft, draping, lightweight all-purpose cardigan, casual, but not too casual. The yarn is very soft with no sign of itchiness. (I can get itchy even with merino wool). It does split a little too easily though. I think there is something funky about the pattern for the front sections. I had no problems with the sleeves, but I changed the decrease rate on the front sleeve-side edges so that they did not decrease as sharply to a point and end up very short of the corresponding sleeve edges. Been doing a Ravelry search and stumbled across your website. I love it! You address so many of the same fit issues that I have, and I tend to instantly like your design choices as a result. 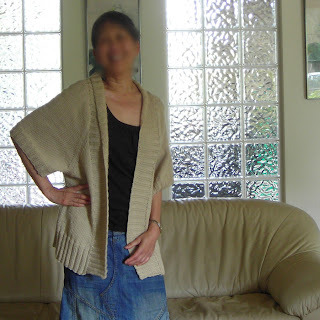 This boxy cardigan has the drape, without the excess fabric, that I often seek but rarely find. And your self-designed golden-y DB Cashmerino Aran raglan short-sleeved top would really work for me, I think. What brought me to your site was the gathered bodice, inset empire waist (can't remember the name) tank top by Lou Schiela in last year's (?) Interweave knits. I may try that one first. Thanks again for your very clear and helpful blog.